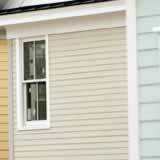 Vinyl siding is arguably the most popular covering for homes today, depending on where you live. It is low-maintenance and comes in a wide variety of styles and colors to fit any decor. Insulated vinyl siding can increase your home's energy efficiency and re-sale value. You may be able to recoup up to 80% of prevailing vinyl siding prices, contractor mark-up included. While undeniably a good investment, vinyl siding prices can also be somewhat expensive at the onset. A two-story home that requires about 2,800 square foot of materials, for example, would run about $12,600 for vinyl siding that costs about $4.50 per square foot. That figures does not include the cost of hiring a contractor for installation. There is no industry standard for siding contractor markups because each business decides on its own profit margins. Industry markups vary depending on how the economy is doing where you live. For example, in an area where the construction and building trades are slow you will find lower vinyl siding prices, contractor mark-ups and labor costs. Mark-ups might run in the 10-15% range. In an area where building is thriving, it's not unusual to see a 30%-40% markup. To get the best vinyl siding prices for your project, obtain more than one estimate; three or four should give you a good idea of your final costs. Make sure each estimate includes comparable items and ask questions about items that differ. Remember-- the lowest estimate may not always be the best deal. While no one wants to pay a higher vinyl siding price, contractor mark-up may be the tax you pay for an experienced and reliable profession. Given the impact on curb appeal and the difficulty installing vinyl siding trim, this may be one of those projects you want to leave to the professionals.